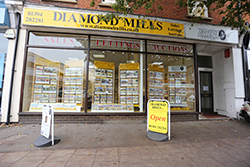 Diamond Mills is an independent firm of Estate Agents, Valuers and Auctioneers with links to the town dating back over 100 years. The senior partner of the company is Nigel Papworth, FRICS, who has been an Estate Agent in Felixstowe for over 35 years. Nigel Papworth's great grandfather Shuckforth Downing worked as an Estate Agent Auctioneer in the town in the 1880s, a tradition proudly remembered by the display in our offices of a poster bearing his name and promoting an auction at The Victoria Hall Sale Room being held on Wednesday 12th September...1888! The original proprietors James Diamond and Godfrey Mills started trading on Hamilton Road, Felixstowe shortly after the Second World War taking over the firm from R J Girling which had been established in the town since 1908. Today, the company is the longest established Estate Agency in Felixstowe and operates from a large prominent central premises at 117 Hamilton Road, which is Felixstowe's main shopping thoroughfare. We believe that we go far beyond what is expected from an Estate Agent and make extra efforts to sell your property and see the transaction through to completion even if this involves out of hours time and effort. Our team of qualified professionals is one of the largest in the town, we are highly motivated and dedicated to providing an efficient and personal customer service. We have clear advantages to fulfil your wishes. For further details of our professional property services including valuations, high quality brochures, floor plans, energy performance certificates please call our office on 01394 282281 or call in and see us at our large central premises at 117 Hamilton Road, Felixstowe IP11 7BL. Come on in and see us, we will be delighted to welcome you. Moving home, we appreciate, can be a very stressful experience and accordingly we aim to offer our personal attention throughout the buying or selling process to enable matters to proceed as smoothly as possible. We appreciate the repeat business we receive from generations of satisfied customers, their families and friends. However we do not rest our laurels and accordingly we embrace any advances in technology which may benefit our customers. If you are thinking of buying or selling, then please contact one of our sales team, Jason Lewis or Conor Driver to make an appointment for a valuation, or to discuss further the services which we are able to offer. Click here to view our current properties. 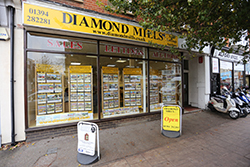 Diamond Mills & Co. have specialised in the letting of properties in the Felixstowe and surrounding area for in excess of 50 years. 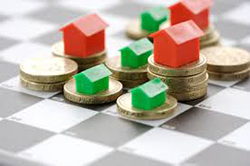 The volume of business has increased dramatically in recent years with the "buy to let" trend being possibly the strongest single factor. We currently let hundreds of properties from our Hamilton Road offices. We are therefore well placed to offer advice on the entire rental market, whether you are a potential landlord or tenant. Diamond Mills & Co have specialised in the management of properties of all types and sizes in the Felixstowe and surrounding area for in excess of 50 years. We are primarily renowned and respected as being the chosen managing agents for many of Felixstowe’s well known leading apartment developments. Our professional management section is run by Jackie Storey and assisted by Katie Rennie, who offer a friendly, personal and individual approach and are happy to assist with any questions you may have. If you are a Freeholder contemplating appointing a managing agent for your development, or if you are a second home owner with a property to let, then contact either Jackie or Katie on 01394 282281 to arrange an appointment to discuss your requirements. 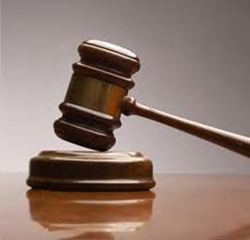 Our Auctioneer based at our sale room is Nigel Papworth FRICS who offer vast auctioneering experience. The department covers the whole of East Anglia with Nigel and Auction Room Manager regularly travelling as far afield as Cambridge, Norwich and Colchester to offer advice on saleable items. When selling items at Diamond Mills & Co you will instantly appreciate the expert knowledge and high level of professional and personal service on offer. If you are thinking of selling, please contact Nigel or Stephen on 01394 282281 to arrange a valuation. 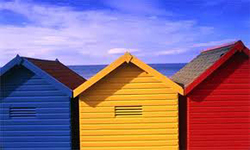 Beach Huts are a common asset in the Coastal town of Felixstowe and tend to be highly sought after all year round. Our local knowledge and longevity in the town has allowed us to closely monitor the market values of beach huts and provide an accurate estimate on current values. 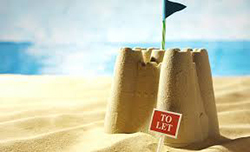 Due to the high demand and affordability of chalets in Felixstowe (compared to the likes of Aldeburgh, Southwold etc) we regularly have people register with us searching for beach huts. Please call us today to arrange your free valuation on 01394 282281.